I like this one. It sums up my motivations and passions. 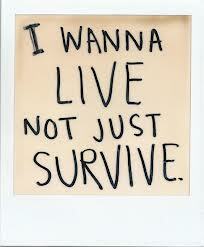 I certainly do not just want to survive life. I wanna LIVE life! How about you? Are you living life or are you merely surviving it? There is so many ways to take this. To me living life is doing what I want to do. I have my family, good friends, good students. I run a great taekwondo academy that allows me to help a lot of people in various ways. I get to travel. I get to have experiences others may not get to have. I work hard every day to improve myself in various aspects of my life. I am not here to survive life. I am here to strive. I am here to conquer. hat you are grateful for? Are you trying to improve yourself each and every day? Are you spending time with your friends and family? Are you experiencing the things you want to? Are you motivated and passionate? I want you to live your life because no one at the end survives it. We all end up in the same place at the end. The point is to make your journey there a great one.